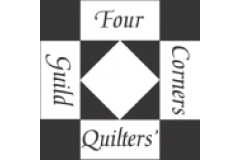 The Four Corners Quilters’ Guild was established in 1998, with the name reflecting the origins of the founding members who lived in the four townships of Egremont, Normanby, Arthur and Minto. Today, we have more than 50 members who travel to meetings from a wide local radius to build their skills and participate in charitable activities. We meet the second Tuesday of every month from September to June, 7:30-9:30 pm at the Mount Forest United Church, 175 Queen Street East. New members and guests are always welcome!